This New York customer demanded a custom, natural looking texture on the deepest black granite available. 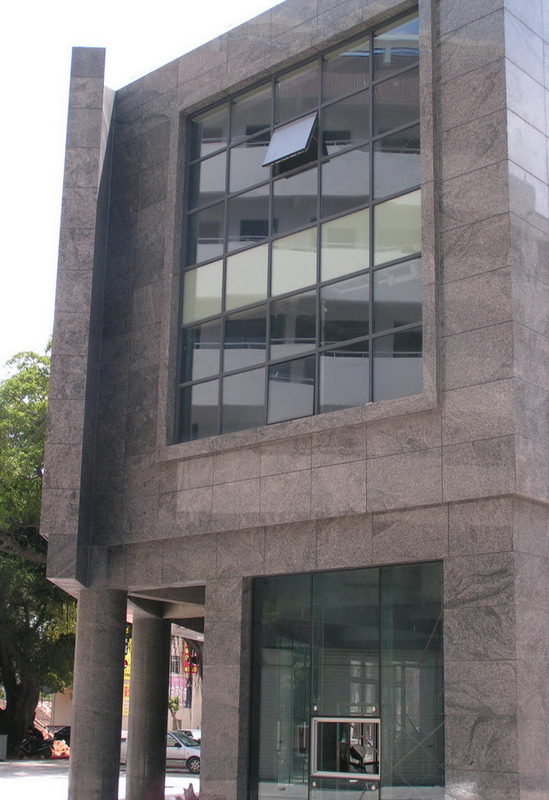 These blocks were custom selected from India, and for balcony caps and the first 10' of the facade, 2" thick stone was custom cut to match the front curtainwall area of the facade. 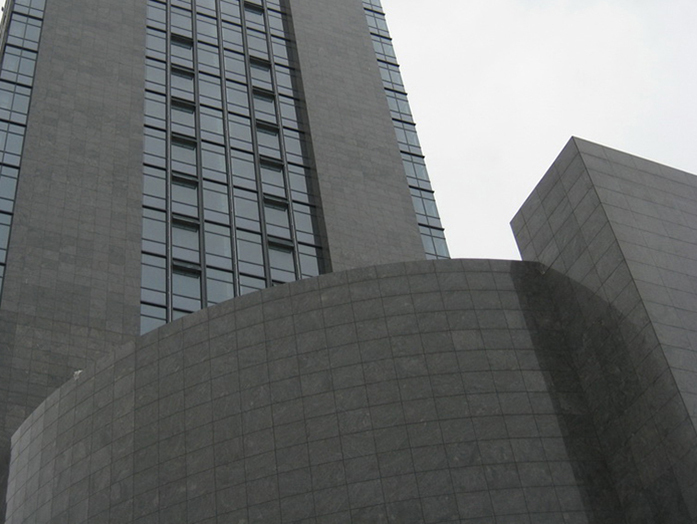 Bonded corners were featured throughout to create sharp edges and corners at the building and adjacent curtainwall areas. This New York glass and stone panel facade required a specific stone match to a 1902 stone on the adjacent building, covered in natural patina. After custom selecting from over 22 unique quarry swatches, the match required special extraction from a Portugal quarry, and due to rushes in the project, all production was completed in under 12 weeks. Ask your StoneSheets Representative to help match existing stones! This health care company required a more typical panelized facade and curtainwall which had both Absolute Black granite and Creme Mocha Limestone panels. 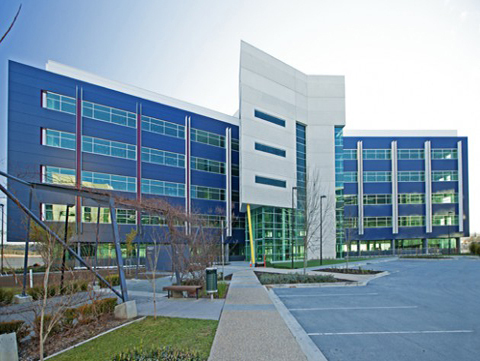 This project featured the Thermax® insulation system by Dow Building Solutions, to which panels were modified to attach to a curtainwall system that did not penetrate the thermal barrier of the rigid insulation system. This Miracle Mile Chicago customer received a facade with grooves placed at 1" intervals 3/8" thick, which balance and coordinate with the joints, so that the grooves are not visually interfered by their placement. 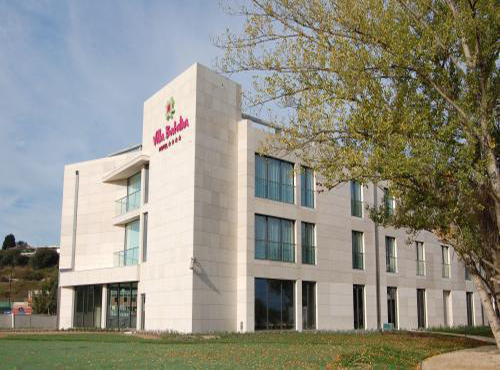 This facade was placed on top of Dow® Thermax insulation, significantly increasing the building's thermal protection, while the facade does not interrupt the thermal barrier of the building. Careful attention to detail and design was required, along with precision manufacturing to execute. This Indian grey granite was custom quarry extracted and contains our proprietary ballistic material within the TL panels on the lower portion of the facade. The column covers were custom carved in circular fashion to coordinate perfectly with the curtainwall panels. Bonded Corners were featured on the lower edges of facade to conceal surveillance equipment and complete exposed edges of the layered soffit panels. Custom selected limestone was extracted for its consistency in color and matched to a specific pantone from over 15 various quarry swatches from around the world. Solid stone caps and footing was required, along with bonded corners on the lower row of the curtainwall. This facade involved many different designers and architects from various parts of the world, requiring careful coordination and execution. The top edges were finished with 2" thick solid caps, in the same block selection as the facade panels. 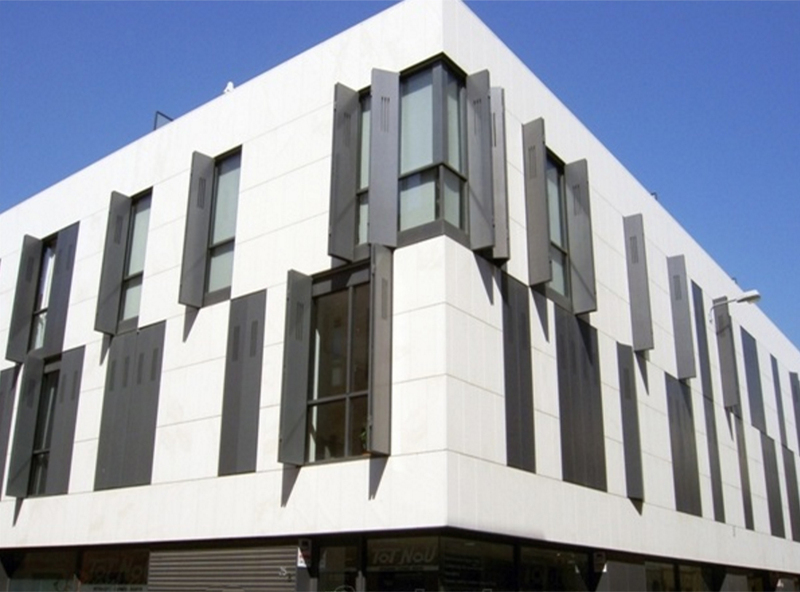 Super thick custom limestone headers were sculpted with curves, as well as coordinating solid accents around the building, with panelized columns and coordinated bonded corner panels. Multiple materials and thicknesses were used, though it could have been created using other options, this was the desire of the architects and designers. The project required multiple coordination with several trades to install and deliver, with limited site space, multiple shipments and deliveries were required. 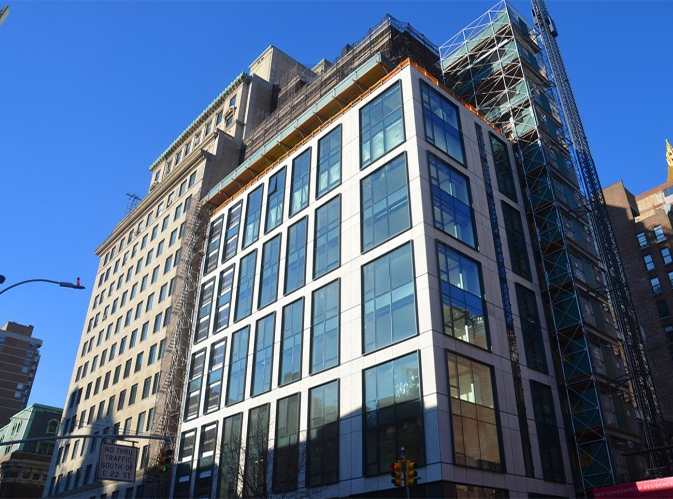 Bianco limestone panels with bonded corners at adjacent curtainwall were made with close coordination of foreign curtainwall designers and contractors. This project, like many, were delivered in phases, with color coding used to bridge language barriers of installation crews. Careful delivery requirements further emphasized the strict requirements for packing and labeling the panels, as well as creating coordinated details for installation maps. 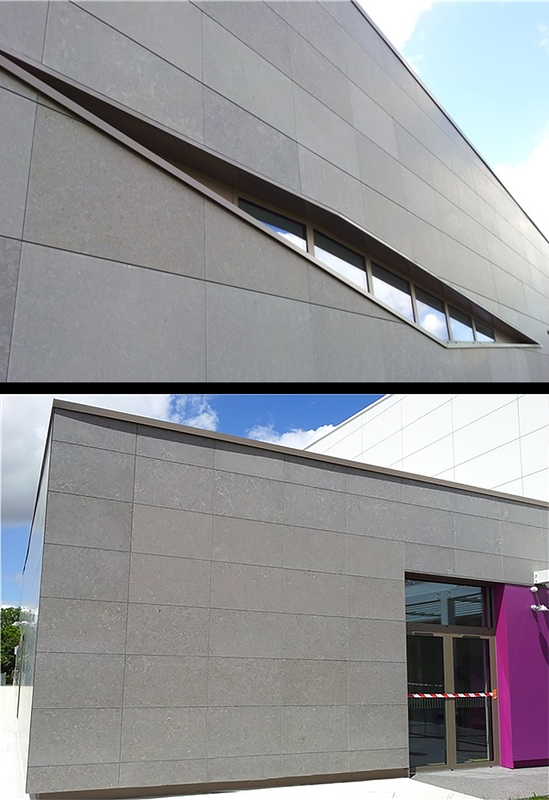 This facade featured three dimensional areas which were created with bonded corners so installation was quick and easy. 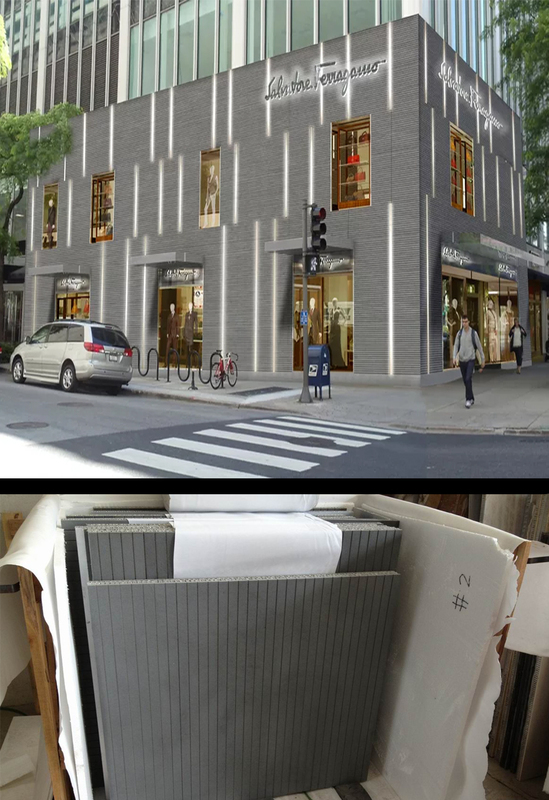 Foreign designers and curtainwall designers, graduates of CWCT (Centre for Window and Cladding Technology), participated in the design and supervision of the facade design. This project was redesigned several times throughout the phases of planning, requiring close involvement in this foreign project, and foreign time meetings, requiring the facade to be tested through multiple governing agencies. Indian grey granite was extracted for the entire project, though installation was in phased spread out over a year long period. Storage of blocks was not an issue, as phases were not planned well in advance, and advanced lamination of all panels was required. This was considered a fast paced project, as timing was not planned well in advance and final revisions were often only 6 weeks from the required delivery date. Though we do not prefer such scheduling, foreign projects often require stringent time tables, which we are proud to be able to meet. 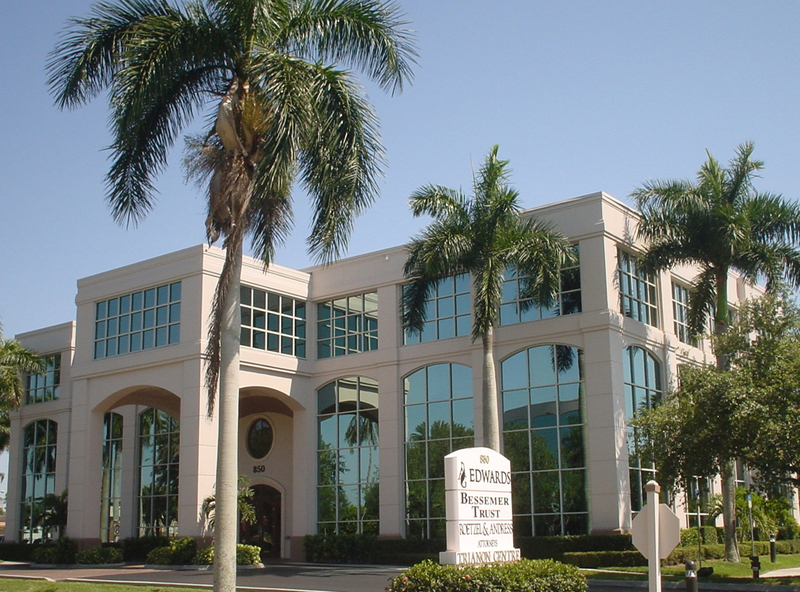 This project was a remodeling job, cladding over existing exterior to reface the building with Bianco limestone. The curtainwall was completed in just 4 weeks, using existing inventory blocks. Bonded corners and pre-attached anchors were featured on these beautiful panels, which were coated in a premium Akemi® hydrophobic sealer to protect the bright white stone finish. Many panels are sold through our distributors, such as this one, emphasizing how well we can cooperate with our partners. 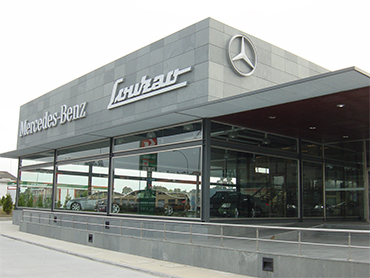 This famous dealership owner required custom selected slate in various materials to complete the design. Tiles, stone panels, and solid accents make up this beautifully uniformed facade and details. Panel details required bonded corners with radius edges at the soffit; coordinating tile was created from the same block for adhesive bonding at the lower sidewalk level of the project. This high-end green slate was custom selected and extracted and required minimal waste to complete all required pieces. Though variance in color is a common characteristic of Sinai Pearl, this was the desired look of this premier project. Careful attention to the edges was made, due to the stone having shell and fossil patterns throughout, which would normally interfere with the ability to sculpt such precise edges. Careful tooling and finishing, as well as panel selection for edge pieces was used to accomplish these sharp lines. 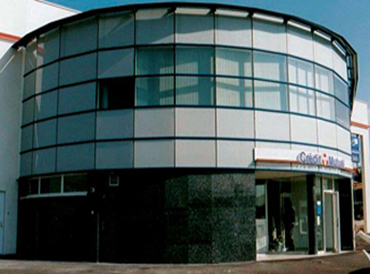 Careful attention to edges was required to create the correct angles demanded in this circular bank curtainwall. Uba Tuba granite, a very hard stone, was desired, and to limit typical polish wear, a special epoxy coating was complete on each panel to ensure a lasting finish. Column covers were created, for the single pillar in front, out of solid stone, carved in a circular pattern. 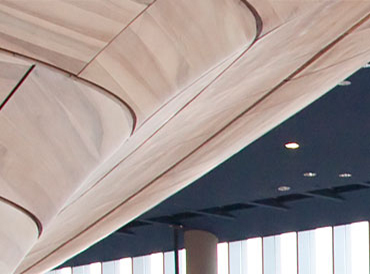 One of the most challenging tasks of our StoneSheets®-TL panels is to accommodate curved details. Through bonded corners, panels are built up with thicker stone that we tool to create a curve. 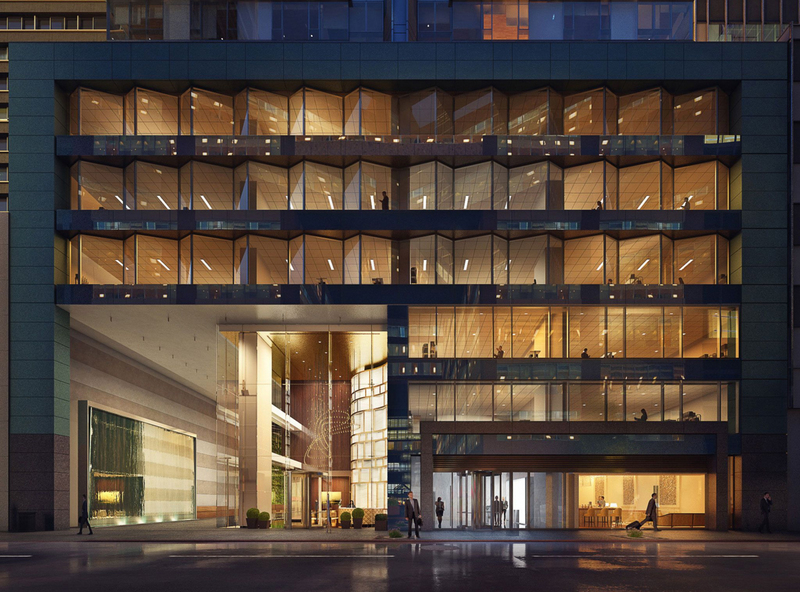 On this project, coordinating this curve to match the angle of the curtainwall requires the finest attention to detail and stone positioning on the panels. This simple project in appearance is actually quite advanced. 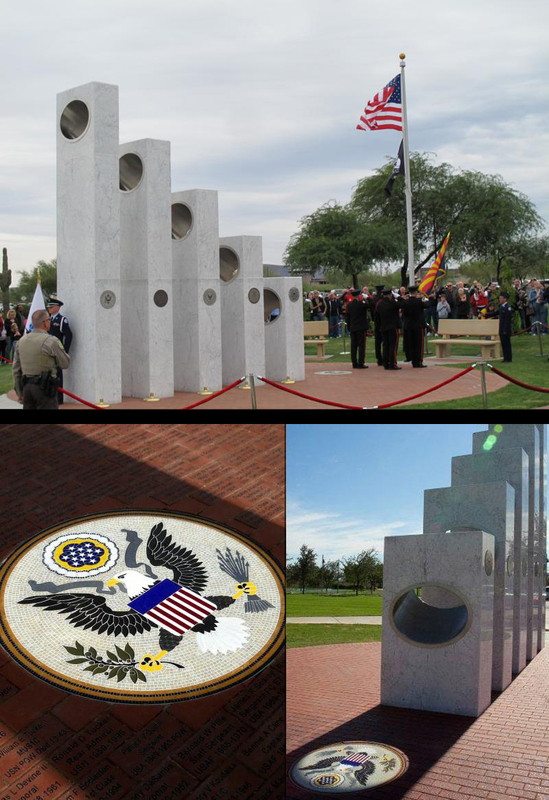 The Veteran's Memorial project was coordinated with a variety of engineers, including that of NASA, to time perfectly with the sun's rays. On November 11th, at 11:11am, the sun shines directly through the openings in the columns, which are dedicated to each military branch, to light up the Great Seal of the United States mosaic. A wonderful dedication to our Veterans and Armed Forces. 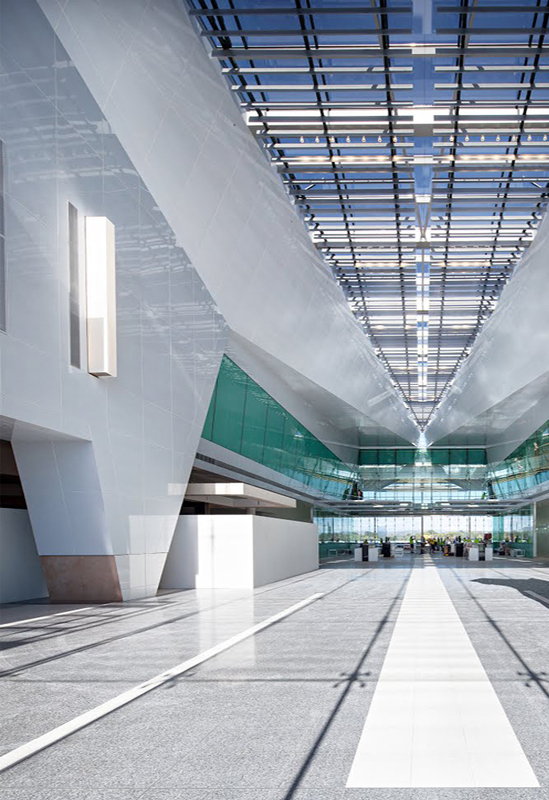 Pure white marble is featured in the interior facade, coordinating with a glazed spider attachment curtainwall ceiling. 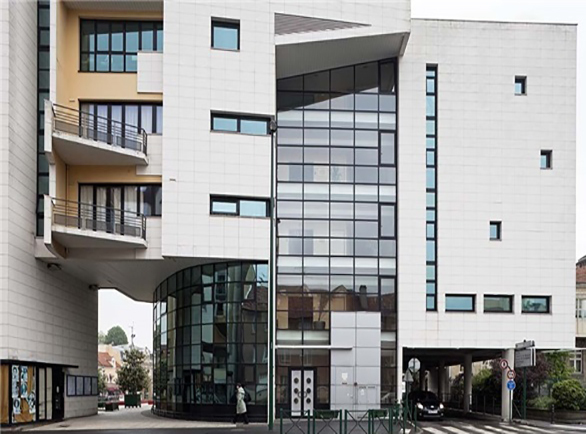 This high-tech facade demanded the purest white marble with a durable polish to maintain lustre and depth, and a treatment that protects the cleanliness of the marble. While stone may not have the pure white characteristics required, significant waste can allow us to select areas of blocks to achieve this pure white look. 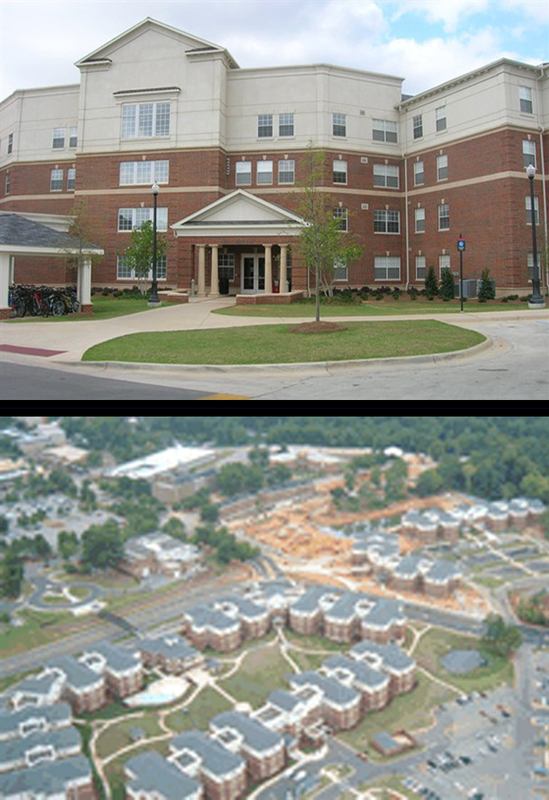 These university residence halls feature limestone and brick facade on buildings, which additionally received black granite counter tops for all interior areas. This project was completed under tight time constraints, with coordination of installation crews for interior spaces and other finishes. This project had to encompass multiple field variances, and coordination of multiple buildings required close labeling, packing, and planning of deliveries. Various patterns and designs are often desired in solid stone facades, and StoneSheets® Materials are able to achieve the same. Our careful craftsmanship offers the ability for our customers to achieve the same looks in our lightweight StoneSheets®-TL panels. Ask your representative what we can complete for you! Three dimensional designs can carry through multiple panels to achieve a broad perspective design, and simple carvings can be made to display building names or addresses. Nearly anything that can be put into CAD files can be accomplished with our state-of-the-art tooling abilities. At StoneSheets, we use the finest laser and water jet equipment to execute the most complicated designs, guaranteeing precision and close, sharp attention to edges and pattern details. We welcome any challenge given to us and look forward to demonstrating our mastery of stone carving and design fabrication. Starting from a block position allows us to offer our customers the most varied types of stone for plethora of applications - all from the same block. 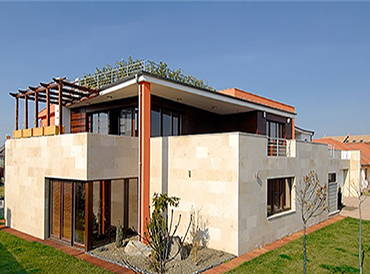 Solid caps and covers, bonded panels, solid stone edges, all are able to be accommodated without having to worry about the matching of stone lots. This ensures the materials are extracted from the same position in the quarry for the closest matching color and textures available.